Born in Kitchener, Ontario, graduated from the University of Toronto in electrical engineering. A scholarship from the Massey Foundation financed two years at Oxford University, England. At university he showed exceptional talent in track and rowing. He taught for a short time at the University of Toronto, but his father’s illness led him to choose a career in business and industry at Electrohome in Kitchener, employing 3,100. Pollock joined the firm and was president for many years. He was also the founder of several media outlets in Kitchener, including CKKW, CFCA and CKCO. 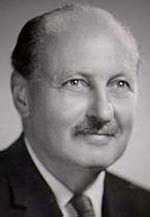 Pollock was a member of the National Design Council and in 1963 he became president of the Canadian Manufactures’ Association. He was convinced that Canadian technology and industry would take no second place. His own firm led in introducing several firsts in the electronics field. In 1975, he was made an Officer of the Order of Canada “for his many services to industry, particularly in the field of electronics and for a variety of community activities.” He was a founder of the University of Waterloo, chairperson of the board of governors for eleven years and chancellor from 1975 to 1978. He was a founder of the Stratford Festival of Canada and supported musical groups, including the Kitchener-Waterloo Symphony Orchestra.